I like that a lot, because it offers a chance to go abstract, while being photoreal, hahaha! OMG ! That's pure magic ! Love those colors ! Did you look at photos references before or did you just improvise ? I'm quite familiar with the subject, though...but this one is really, really sloppy, too. I think, I'll do a nice one later, too! Curriously saving the image in JPG or PNG make it some dark so here in GIF! Mystery of the Universe of 01! Last edited by Pilou on Wed Jun 13, 2018 11:17 pm, edited 1 time in total. Towards the end of 2001 - A Space Odyssey it had these bizarre early computer effects, if you've ever seen that... it totally reminds me of that! When I watch it for the first time, I had terrible tooth-ache and this whole sequence didn't want to end.... THE PAIN, hahaha! Nowadays I enjoy it a lot more! Yes the way to the other side is not so short! I had in mind to do this one in Verve already, and it took me 2 hours to complete. This is a theoretical envisioning of our universe called the "Cosmic Web," which would be a very infinitesimal portion of it because the universe may be infinite. 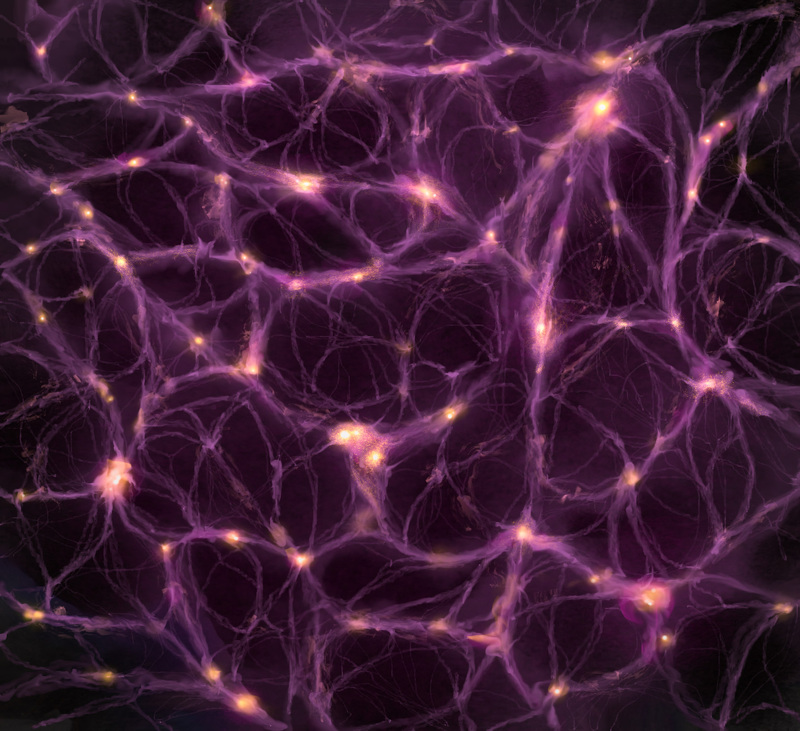 It is believed that each connecting filament are composed of countless galaxies held together within halos of "dark matter," which make of 85% of all conceivable matter. Each of the brighter nodes are highly dense clusters holding perhaps countless billions of galaxies - if that gives you some idea of the scale. This image would represent a 2D-slice of a good 100 million-light-years across in dimensions. Simulations have been made on large NASA super-computers and the Hubble Space Telescope has made some astounding confirmations on the theorized structure of the observable universe. It gives me pause to think of the grandeur of it all. I know the universe is most likely NOT purple, but in fact would be a dim teal-gray so dim that our human eyes wouldn't really be able to see anything more than the cluster which would just look like stars - but I always liked the purple version. That is beautiful, Mike! I just think (feel like knowing) that they look at it like children, staring at a nicely constructed Lego castle, you know, haha! Science prides itself by using measure to confirm math, which has evolved from prior measurements. Even though it carries them deep into the observable mesh of dimensions, they have a hard time to acknowledge the fundamental workings beneath it all. Hence they call something "dark matter", which is ever so cute, because in their eyes everything is either matter or energy, haha. But both those subjects are merely on the surface of what we do observe with instruments constructed and run with both of those. To understand the fundamentals of the universe and thereby existence, one can only rely on analogy through imagination and then see if that holds up to some extend during some experimentation. Thus you measure not to discover, but only to confirm, really. Even then it may well remain unclear...which is the dilemma. This is not to say that those models are "wrong", or useless in any way. It only goes to show where we are as "intelligent" species, hehehe. I do love to think and talk about these things, obviously. I think we yet have to fully acknowledge, that complexity has its origin in simplicity and if we approach such subjects from the point of view of the latter, we will leap dramatically forward in our understanding not just about the fabric of the universe, but about our own function as part of it or rather as manifestation of it. We think of the grandeur of size, when we ponder over the universe, imagine it to be inconceivably complex, when we look at stars and galaxies, but within us is equal if not greater complexity that is just as undiscovered and of exactly the same concept as it all. One need not look very far to recognize the similarity of what you've illustrated there to the neuronal network within brains. ...but it would be silly to elaborate on that, hehe...just funny. The universe's boundaries are set by conception and resolution, neither are confined to specific size or time (both are just measures within the workings of the universe and are of no concern to the "worker" of the workings! ), which is why it could be considered infinite, which it is not, at the very least not in the dimension we represent directly. If it was infinite now, there could not come a dimension after us, but by analogy there's a very good likeliness that there is. Thus...my second sketch for this topic has been pure text!